Big Wheel Building: I have issues: I need space. I have issues: I need space. Take a minute and try to imagine every single thing that you 'need' when you head out on a bike ride: Bike. Clothing. Food. Sunglasses, shoes, helmet, and gloves. Tools, tubes, and spare parts. Camera? GPS? Batteries? Alright, now put all of that into a mental pile for a second. What if that ride were going to be overnight? Then you'd need to add shelter of some sort (tent, sleeping bag, sleeping pad), more food, perhaps a means of cooking it, and a means to procure water. Got that added to your pile? Now, imagine that this overnight ride is going to actually be more like 25 overnights--over three weeks out. And it's going to happen during the Alaskan winter. Got all that? Pretty big mental pile, eh? Now load it all onto your bike. Ha! Three weeks where you have no possible chance to get so much as a toothpick if you need one, unless you've been carrying it along the whole time. 3 weeks worth of toothpaste, TP, clothing, food, shelter, and all the little necessities. If you give this any thought at all, you'll quickly realize that you may or may not even know how much TP to take for a 3 week trip. And that's only the beginning of the head games. Deciding what and how much to carry is one part of the puzzle, figuring out how to carry it is another. Since the aforementioned trip will occur in winter, the sheer amount of insulation, calories, and fuel that need be brought further compounds the head games. It took about 500 miles for me to finally get it through my head that it was unrideable on anything but flat tarmac, and then only just. Ask Bill M.
Almost completely opposite from the '05 version in that this one was awful on flat tarmac, and got better on snow and even better still as the snow got softer and more technical. The problem with both is that third wheel hanging back there and creating another chunk of rolling resistance. I never had any illusions that it'd be easy to pull a ~90lb trailer in soft snow, but I also never envisioned just how slow it would be. I ended up having to take more stuff along to account for the slower pace of pulling the original load of 'more stuff'. And while we're heading in a different direction right now, I may still end up using the '06 setup again, as it may prove to have the fewest compromises. But for now, we've taken a different tack, and one that I'm not completely certain is the 'right' one. Many folks have been telling me (some of them for years) that I should just throw it all onto the bike and ride it that way. This is a good time to go back to the opening sentences above and think about how much stuff one needs for three winter weeks at 65 deg N lat. Then look at the pics of how much 'stuff' is packed onto the trailers. Then consider that I'm no slouch at packing light. Lastly, consider that riding snow poses it's own set of problems, and distribution of one's load makes all the difference between riding and walking. Load poorly even on a 3 day sashay and you'll walk more than ride. Load 3 weeks worth of stuff onto two wheels and the odds are that you're gonna walk, period. Snow trails are often nothing more than a few mm of crust left by a fast moving snowmachine. Overload that crust and your speed goes from 3-4 mph to 0-.5 as the effort to maintain it increases exponentially. I *did* mention that I'm not sure this is the right road to follow, didn't I? Among many, many, many other ideas that have been batted around this summer, this is one of the few that is unequivocally a 'good one'. The only good reason for a titanium dual crown rigid fork is (IMO) to store fluids that would otherwise take up valuable space elsewhere on the bike. In this case, that fork will carry about 8 days worth of fuel for melting snow to make water, which will in turn be used to rehydrate food, hot chocolate, and eventually me. The new fork is awesome...puts more weight on the front AND increases fuel storage. On a standard frame it seems as if the rear wheel ends up displacing more than its share of the load. In order to reduce rolling resistance but maintain a ton of storage, could you take the concept of Surly's Big Dummy and "winterize" it? Pretty intriguing stuff, MC. 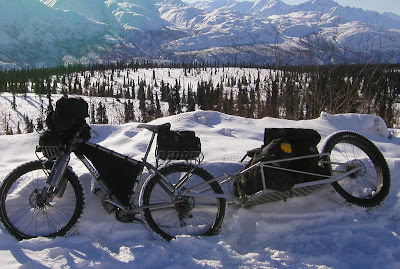 I admit that I still have zero desire for snow biking, but it's nonetheless interesting to read about. Good luck on your adventure. That is incredible, Mike. I have done some self supported, over the road stuff in South Dakota, and I've felt the pinch of being under prepared, so your mental list thing gives me an inkling, I think, of what you mean. But I can't help thinking about "Bikes. Not Bombs" and thinking instead, "This Bike is a Bomb"! Dual crown rigid fork -- I love it. Pushing the limits, as usual. The '05 setup was ridden in '06, and likewise '06 was ridden in '07, right? Always good to get an update. The concept of riding unsupported, w/o towns, for 3 weeks is still well beyond my grasp. But it's fun to think about. It's not fun to think about pulling all that weight, but the challenge of how best to do it is sure interesting. 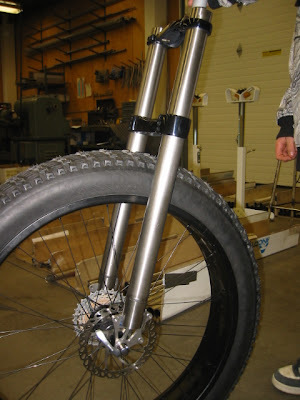 DB-Lengthening the rear end (like the Surly) doesn't really gain anything, and it definitely has some disadvantages. IMO, if you aren't going to use a trailer, a short WB is the best way to go. I'm surprised to see you dismiss the long-tail idea. 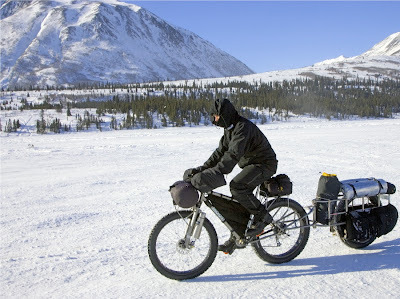 Lengthening the wheelbase on a bike designed to carry a large load has many advantages. I've ridden loaded long-tail bikes on pavement and dirt and much prefer the handling over a trailer. I have no deep snow experience on a bike, so perhaps there is something I'm missing here. Dunno about all this bike stuff, but the new top pic is STELLAR. So I am guessing that extra large panniers front and rear just don't provide enough space to put everything? Perhaps the balancing of the load is to tough. Seems that if you get all that stuff from the trailer on to some massive racks and panniers front and rear, you could eliminate the extra third wheel resistance. Not enough tubing for all the fuel? Maybe extended the wheelbase just a few inches instead of a whole extracycle length. I am sure you have thought of this and since you haven't attempted it, it must not be feasible. Thoughts? BTW Love the blog, much better than that MTBR crap. keep it up MC! Maybe I'm thinking about this too much. I seem to recall the reason for the trailer was increase tire surface area, needed because of the increased weight of your load. Kinda like bigger snowshoes for a bigger backpack. If you are losing the trailer, but carrying the same load, it would seem that the Endomorphs won't provide the flotation needed to not bog down in softer snow. So, what's going on here? A return to a Hanebrink style Monster bike with an ATV rear tire? A rear tire from a Yamaha TW200? Maybe take a page from the skiers and snowshoers and pull a sled? Enough speculation on my part, back to work. Some good questions here. The ExtraCycle thing (aside from handling poorly and requiring HUGE amounts of body english to keep it going in techy conditions, if even possible) poses some difficulties with the drivetrain/chainline on a fat tired bike. Going longer (than the current ~17ish") just makes the chainline worse, and you end up needing a still-wider BB or using fewer cogs out back, or both. Sub optimal. In prep for a similar distance/time/effort ride as what I attempted last winter, I've been able to cut/eliminate/ditch over *30* pounds of stuff. And that number may push closer to 40 before I shove off. Until last year's trip I had no idea what I was getting into. Now I have a little better idea, and can plan and prep accordingly. That lack of weight helped me to see that going trailerless *might* be doable. But another thing that helped was seeing/riding a 100mm wide rim on snow, using a Surly Endo. The increased width of the footprint as well as increased squareness of that footprint have me believing (with fingers crossed) that it just might work. In load carrying as well as stability, relative to a Surly LM rim and Endo tire combo, the 100mm rim/Endo is noticeably superior. Maybe not good enough for a 3 week over-the-snow unsupported winter trip, but I'm gonna at least take a crack at it. Praytell, what rim area you using? 100mm wide? A second question about the rim. That fork looks incredible! I can't wait to see what it is attached to. Talk about pushing the 2 wheeled, self propelled envelope. The HPV guys around here love it when I email them links to your stories. Here's to another good year on the snow!